Heat oven to 275°F. Line large cookie sheet with cooking parchment paper. In large bowl, beat egg whites with electric mixer on medium speed until stiff peaks form. Gradually beat in sugars, then vanilla and vinegar. Beat on medium speed 5 to 7 minutes or until glossy and stiff and little grit from sugar remains. In small microwavable bowl, microwave Nutella™ uncovered on High 20 to 30 seconds or until slightly warm and easy to drizzle. Drizzle warm Nutella™ on top of meringue mixture (do not stir in). 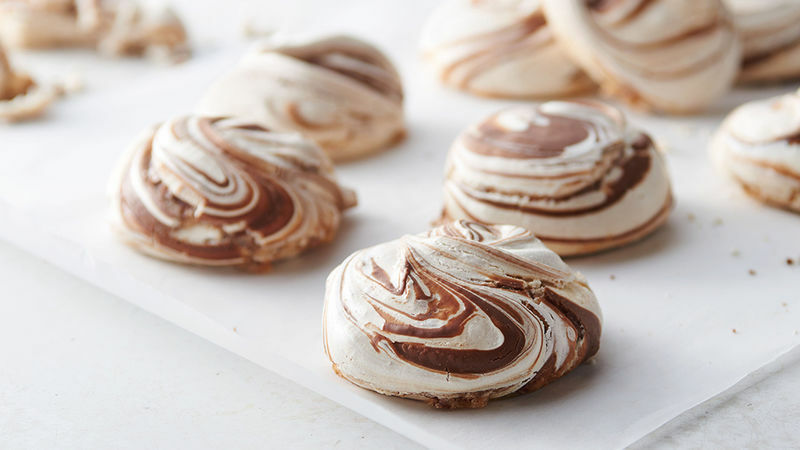 Spoon heaping tablespoons of mixture onto cookie sheet 1 inch apart; Nutella™ will naturally swirl into meringue as you spoon out mixture. Bake 40 to 50 minutes or until cookies are dry and can easily be pulled off paper. Turn oven off; leave cookies in oven with door closed 1 hour. Store cookies tightly covered at room temperature. Egg whites achieve more height when beaten at room temperature. Separate eggs while still cold, then let whites stand, covered, at room temperature 30 minutes before beating.